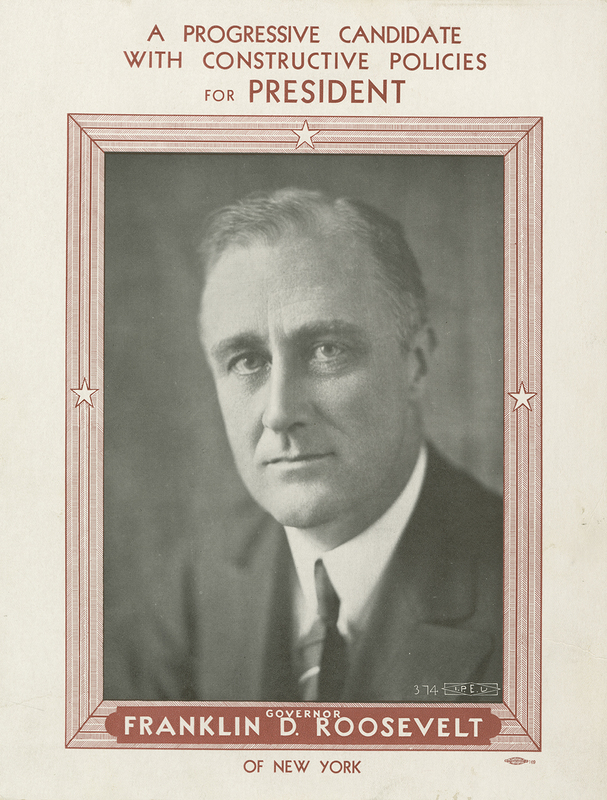 1932: FDR’s First Presidential Campaign | See How They Ran! The depressed state of the U.S. economy determined the 1932 election contest between the incumbent, Herbert Hoover, and the challenger, Franklin Delano Roosevelt. After the great stock market crash of October 1929, and its rippling impact around the world, every aspect of American life felt its effects. By 1932 almost a quarter of all workers were unemployed, hundreds of thousands had lost their homes to foreclosure, and tens of thousands of farms were being abandoned in drought-stricken states, setting off a great migration to California. Hunger stalked the nation and food lines proliferated in major cities. The homeless set up encampments wherever they could, including in Manhattan’s Central Park, and they became known as “Hoovervilles.” Private charitable organizations ran out of funds to provide for such basic necessities as food, clothing, and medicine. Governor Roosevelt and his advisors saw these dire conditions and concluded they had to provide relief or people would die. In a path-breaking first for state government, FDR started several employment programs. At the national level, President Hoover did nothing. He was so steeped in the ethos of self-reliance and private philanthropy coming to the aid of the desperate that he could not make the philosophical leap to understand the public obligation to help the nation’s citizens when no other options were left. The 1932 election would pivot on these two conceptions of government: passive or engaged. Hoover was the status quo, FDR the symbol of hope. 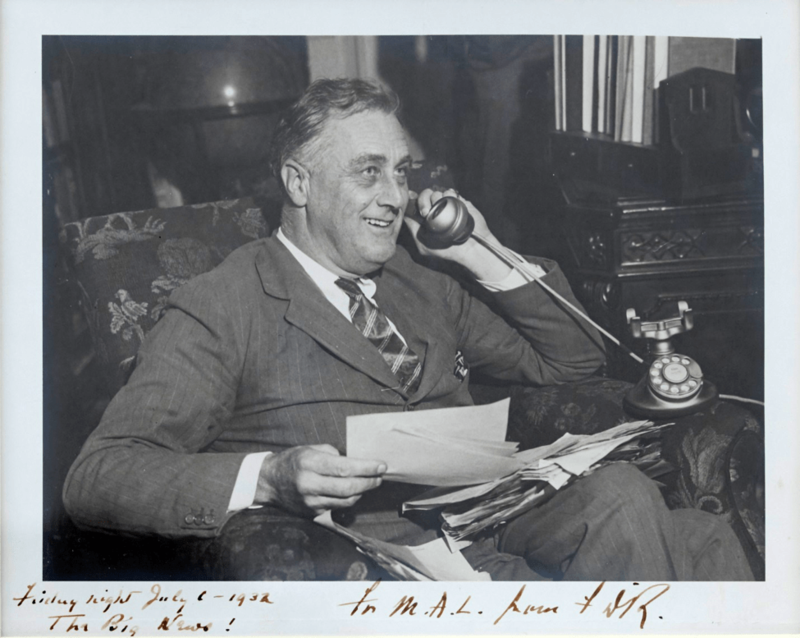 As governor, FDR had continued to cultivate his Democratic contacts around the country. 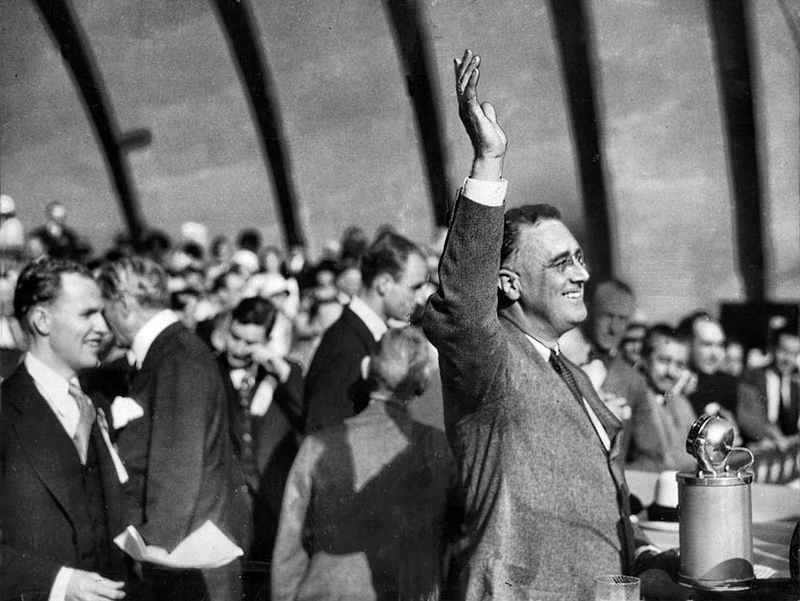 Thus, his supporters came to the convention in Chicago in late June 1932 knowing they could make an impressive case for him with his strong credentials in government service, ideas about how to fix the economy, and a nostalgic echo of the achievements of his famous cousin, former President Teddy Roosevelt. These assets were enough to overcome the interests of Al Smith, who wanted another chance at the White House, and other regional candidates like Speaker of the House John Nance Garner of Texas. Garner would give up his pursuit of the top nomination in exchange for the Vice Presidential slot. It was during this campaign that many Americans would come to know Roosevelt via newsreels and the radio. Indeed, his skillful use of the radio became a signature of his presidency. FDR’s 1932 campaign appearances were frequently accompanied by “Happy Days Are Here Again,” probably the most famous presidential campaign song in American history. On November 8, 1932, the Democratic ticket was swept into office. 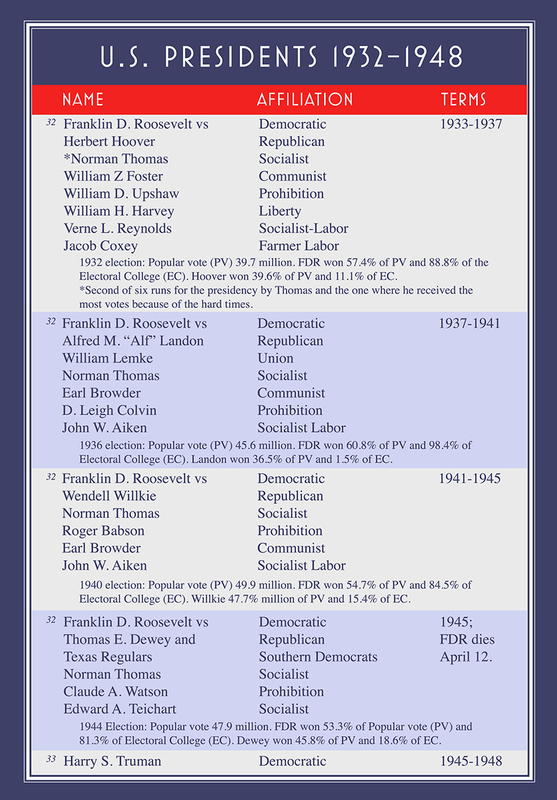 FDR won with 22.8 popular million votes (57%) and 472 electoral votes, and carried 42 of the 48 states. Hoover lost with 15.7 million votes (39%), 59 electoral votes, and carried 6 states. Only Norman Thomas, the perennial Socialist candidate, had a significant vote (885,000 votes) among the minor parties. The Democrats also won a majority in the House and the Senate. Howard Chandler Christy. Re-Elect Herbert Hoover. 1932. Two of these posters are by Howard Chandler Christy (1873-1952), a highly successful artist and illustrator. He made his mark during the Spanish-American War for his portrayals of its leading figures, including then Colonel Theodore Roosevelt. 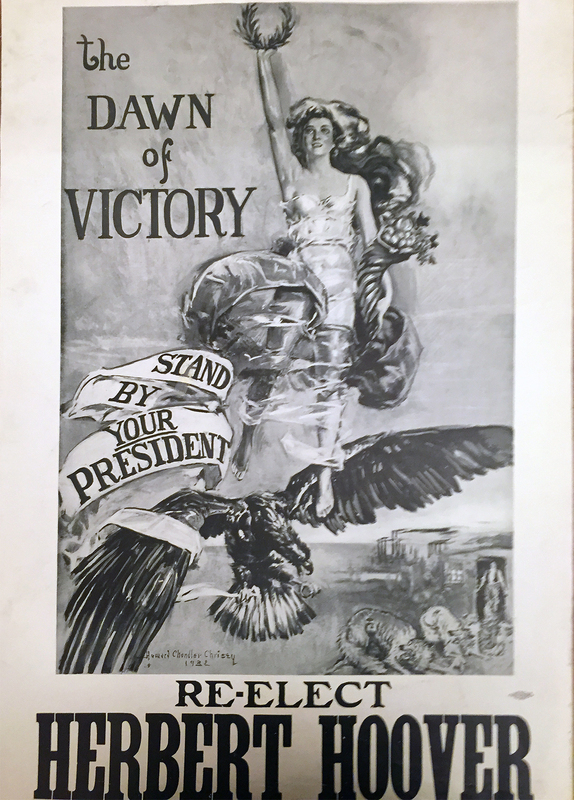 He followed this with elegant depictions of strong, young American women who became known as “Christy Girls’’ – successors to the Gibson Girls – and patriotic World War I posters for recruitment and Liberty Bond drives. He produced numerous magazine illustrations, portraits, and a major series of patriotic murals, including “The Signing of the Constitution of the United States.” Unveiled in 1940 in the U.S. Capitol Building, it was the largest and most expensive painting commissioned by the government at that time. In contrast to other artists of the 1930s, he didn’t seem aligned with any particular political party. 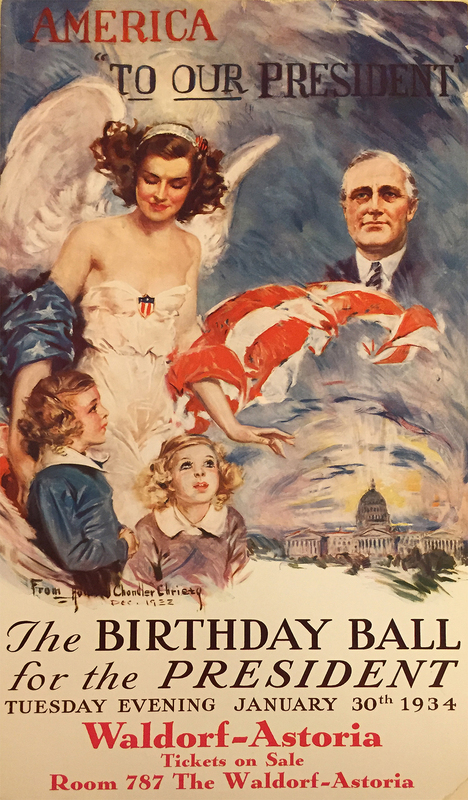 As a working artist he took a range of commissions so that within two years he had designed a poster for Hoover’s campaign and then one celebrating the thousands of annual events beginning in 1934 – collectively known as ‘Birthday Balls’ because they were held on FDR’s January 30th birthday. They raised money for the Warm Springs Foundation to care for polio victims. Both posters featured beautiful young women and patriotic symbols in Christy’s characteristic romantic style. In contrast to Christy’s work, most campaign posters were anonymous. This sober photo of FDR reflects the serious issues and difficult times. The poster’s slogan, “Constructive Policies,” suggested he would do something important to address the problems of the nation. FDR’s 1930 landslide re-election as New York Governor positioned him well for the Democratic nomination for president two years later. He is shown here, July 1, 1932, receiving the news of his selection as the candidate at the Governor’s Mansion in Albany. Of his Convention speech the next evening, one reporter noted, “It was evident that the thousands of people believed they were in the presence, not only of the nominee of the Democratic Party, but of the next President of the United States.” FDR inscribed this photo to his Personal Secretary, Marguerite “Missy” Le Hand. 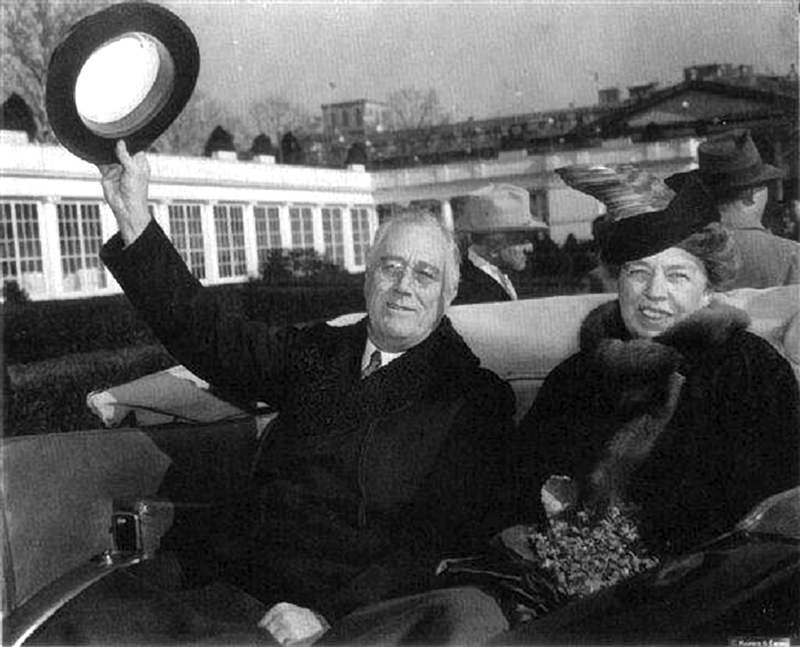 The Roosevelts departed for Washington from their New York City home on March 2, 1933, after FDR spent many weeks there planning his administration and making cabinet appointments. Their car traveled to downtown Manhattan along streets lined with cheering supporters. At Liberty Street the cars boarded a ferry to cross the Hudson River bound for the Jersey City terminal of the Baltimore & Ohio Railroad for the trip to the capital. This is preeminently a time to speak the truth, the whole truth, frankly and boldly. Nor need we shrink from honestly facing conditions in our country today. This great nation will endure as it has endured, will revive, and will prosper. So first of all, let me assert my firm belief that the only thing we have to fear is…fear itself — nameless, unreasoning, unjustified terror which paralyzes needed efforts to convert retreat into advance. In every dark hour of our national life a leadership of frankness and of vigor has met with that understanding and support of the people themselves which is essential to victory. And I am convinced that you will again give that support to leadership in these critical days…. This Nation asks for action, and action now… We must act and act quickly. The speech was broadcast live nationally. While Calvin Coolidge was the first president whose inaugural address was heard on the radio in 1925, by the time FDR took office millions more Americans had radios. And while prior inaugurations had been recorded on film – starting with William McKinley in 1897 –the newsreels of FDR’s swearing in were the first with sound. During his almost 9,000-mile cross-country campaign trip by train, FDR traveled along the California coast to Los Angeles. On September 24, 1932, he spent a long day among cheering crowds, with a parade – viewed by 200,000 people – lunch, and finally an afternoon speech at the famous Hollywood Bowl. An evening of entertainment at the Los Angeles Olympic Stadium was organized by Democrat Jack Warner, of Warner Brothers, and Will Rogers, a star for the Fox Film Company, was the emcee. Warner brought a whole cadre of his contract players, including James Cagney, Bette Davis and Edward G. Robinson to support the Democratic ticket in the 1932 election and those that followed. Warner Brothers produced movies that supported FDR’s policies and later was among the first studios to make anti-Nazi films. This remarkable “ticket” for a campaign event in New York City at the Astor Hotel features the names of many well-known celebrities in the entertainment business. FDR became ill with polio in August 1921 while vacationing at the family’s summer home on Campobello Island off the coast of Maine. The disease paralyzed his legs and he never walked again. He was fitted with crutches and steel braces and used a wheel chair in private. He underwent physical therapy and sought a cure in the waters of Warm Springs, Georgia, but experienced no improvement. He later acquired Warms Springs and set up a convalescent center there for other “polios.” In 1938 he founded the National Foundation for Infantile Paralysis, popularly known as The March of Dimes, to collect enough money to provide care and pay for research to develop a vaccine to protect against the disease. By the time FDR ran for president he had learned how to move – to appear to be walking – without using crutches. He would firmly link arms with his oldest son James, or an aide, for support on one side of his body, and then used a cane in his free hand. With the muscles he had developed on his powerful torso, he was able to swing his legs, which were rigidly encased in his steel braces. For his inaugural speech, Americans saw FDR ‘walk’ (move) slowly to the rostrum securely on the arm of his son, showing the nation his strength – his mastery of movement in spite of his crippled legs – to inspire hope and repair the economy. FDR was not only known for his cane but also for his cigarette holders. Like many men of his generation he was a heavy smoker, consuming at least a pack a day. This is one of several holders that he owned and used and is believed to be the one he is holding in this photograph. The holder and its cushioned leather case are both quite worn and show heavy use. At the time, the serious consequences of heavy smoking were not well understood, although FDR’s doctor did advise him to cut back in later years because the habit was causing health problems. In contrast to his smoking, FDR drank in moderation, favoring martinis before dinner. Like many other Americans, he disapproved of Prohibition and by 1932 supported its repeal. In February 1933 Congress passed the 21st Amendment to undo the 18th Amendment and by December of that year it had been ratified, making the sale of alcoholic beverages legal again where permitted by local and state law. “Cactus Jack and Franklin D. (1932)” from Election Songs of the United States by Oscar Brand. Released: 1960. Track 23 of 26. Genre: Folk.